We are looking at taking over a laundromat that old owner let run into ground. 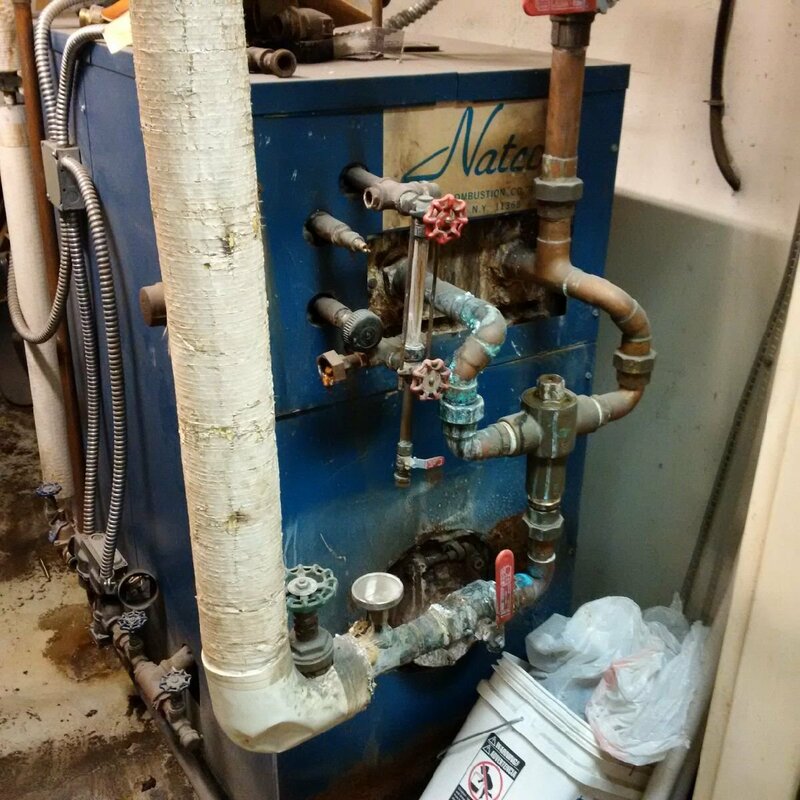 We didn't think things were that bad until we looked at the two boilers in the back of the building. We reached the original business owner of location before he later sold it and the person he sold business to ran the business into the ground. He said the boilers were used just to generate hot water and not for heating the space the business occupies. 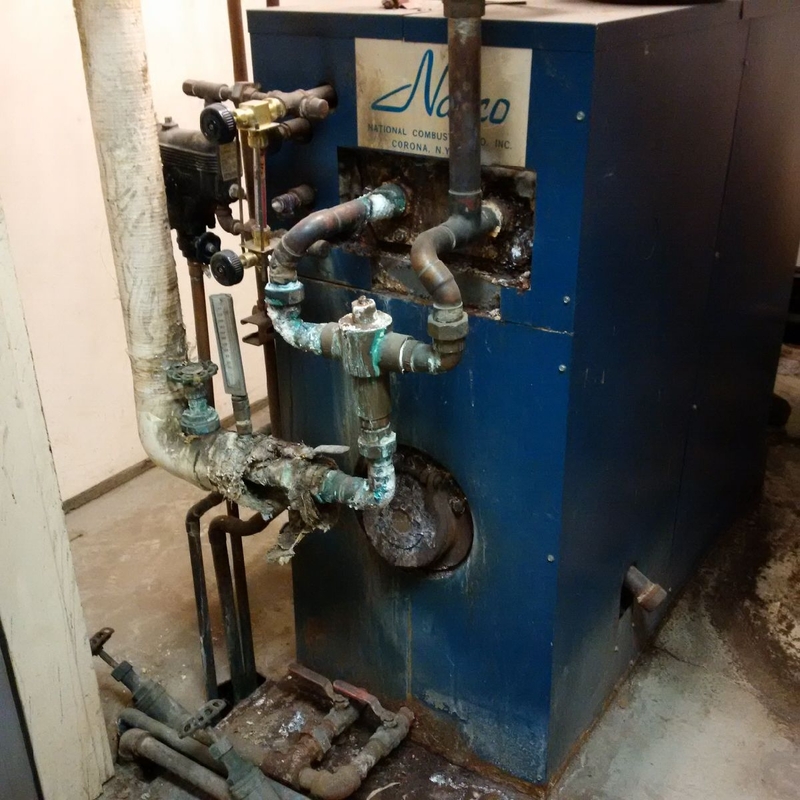 We emailed the state boiler inspector who left his business card on one of the boilers and sent him the photos posted here; he recommended changing out the boilers. A Lochinvar sales person happen to be passing by and we brought him to look at the boilers and he suggested the same thing. He pointed out the boiler on right was turned off and we assumed that machine was dead. He took a look at the number of washers in the business and recommended either two of the Lochinvar Shield water heater with built in water tank or two of the Lochinvar Armor X2 water heater with exterior water tank. Probably common sense, if not my gut tells us to replace the boilers. The Lochinvar sales person provided good insight and information; any different brands we should looks at or any other advice provided would be appreciated. Thank you! 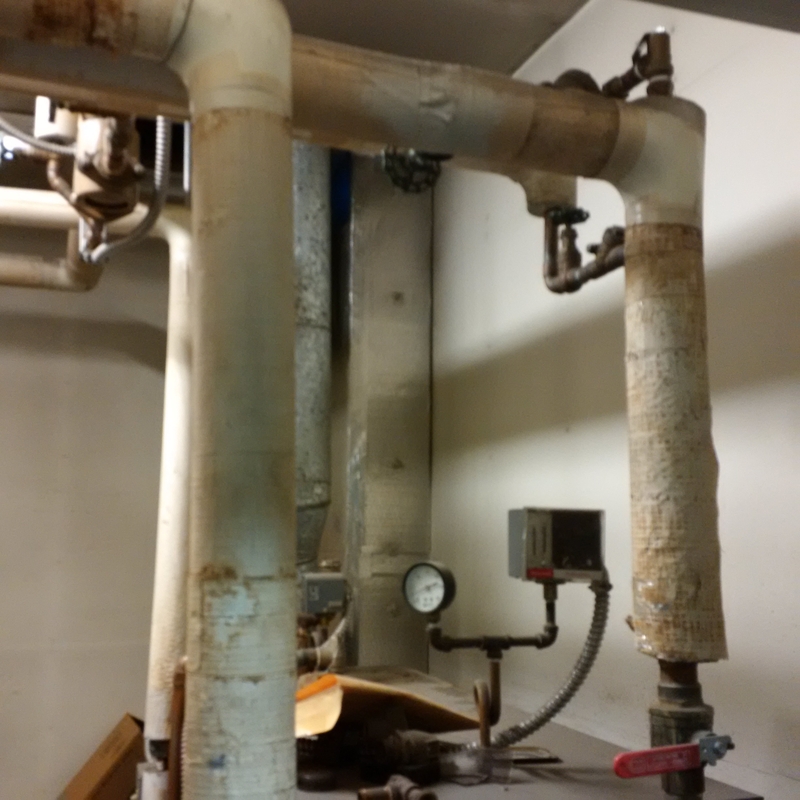 Are those steam boilers with hot water insert coils? What does heat the building then? The original owner mentioned coils, and that it would be a good idea to remove them and have cleaned out. The building is heated by some other system owned by the landlord that heats other units in strip mall where business is located. Sure there isn't any steam-powered equipment in that place? 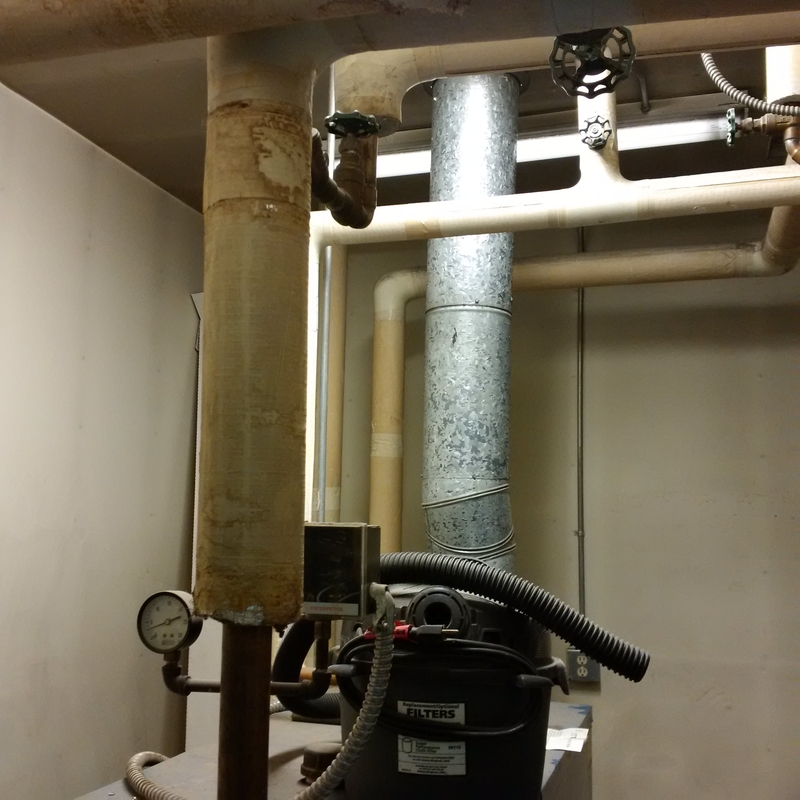 Is there a steam line coming out of each boiler? You'll want a pro to look at this. Where are you located? What does your gas bill want you to do? When I bought my laundromat I got copies of the gas bills and earmarked a percentage for dryer usage and a percentage for hot water production. Number of washers, their size, turns per day, dryer output, dryer cycle time .... from there I was able to confirm the need and estimate ROI for new boiler. Is this your first laundromat purchase? I recommend leveraging the Coin Laundry Association and a local laundry equipment distributor that you trust. Boon, this is our first Laundromat, and the Coin Laundry Association has a lot of information. Another Laundry owner in another state also recommended them. We still need to check the electric/gas bill; but I am sure it will reduce once we replace the boilers and go to new water heaters which will probably be more efficient than the old boilers. Whites Plbg & Heating in Kenai and Rockys in Fairbanks are two top hydronic shops that do a lot of unique work. This is certainly a do over. The first step is to figure out what your needs are. The machines will all have ratings indicating how much hot water they will use. Figure that out and add it up. As for brands, It really depends. You absolutely want something that is well supported in your area. Having more than one unit would be a good idea. If one goes down, you can still stay open. Another factor is local water quality. You want to find a product that will work well with your water. The last thing you want is a unit that is constantly fouling. I good local contractor will be invaluable on that one. Hot Rod, location is in midtown Anchorage. Zman, thank you for the information. Also, not sure how quickly you are going to move on this but I'll be in Anchorage the middle of October. I'd be happy to put and eyeball on it if you can wait that long. JUGHNE location has natural gas. Jack, we'll see how things progress, we just started getting into this. Tankless is interesting; how would hot water be generated however? Another brand you could consider is HTP, Heat Transfer Products of MA. However given your location you need to take into consideration availability of repair parts. It seems Lochinvar must be common there? Your current boilers look like steam boilers to me. Do you have any pressing equipment in the store ? Hello JUGHNE, The Lochinvar sales guy was passing by in a sales truck with demo models inside..I pretty much chased him down. He came in and took a look at the setup and said recommended what I wrote at the beginning of this thread. He's based in here in Anchorage and has install contractors with parts in town. Bob, I can find out from the original owner who is still around and who installed them way back when if they are steam or not. No pressing equipment at all in the location. Thank you for the information on Heat Transfer, I'll see if they have any sales/supports up this way. The one person I could ask is my father whose worked with power plants all his life, steam, diesel, etc. in the merchant marine and with Johnson Controls, etc. The only problem is he will spend two hours as usual showing me how smart he his waving his arms around saying this pipe goes here and there and does this and that versus giving practical, easy to understand advice. But that's the cost of free advice I guess. Old guys are just that way.....ask any of my children & grandchildren ....yup, that is the cost but they come back for more. I'll bet Bob is exactly right. The facility probably had steam equipment at one point. In reality what you have right now is a tankless setup. It just started as steam boiler that also heated the water. I've seen laundromats use anywhere from 3 to 8 tankless units to operate. When you look at the use pattern of laundromats you have frequent periods where no machines are going and then maybe couple. Sat/Sun mornings and everything is filled. The advantage of the tankless here is that you are not storing water and if only one or two machines are running only one tankless will fire to satisfy the demand. As more washers are brought on line the system automatically brings on more capacity. Another advantage is that if one of the machines goes down you have redundancy. You can affect a repair and still be in business. I have designed a number of laudry facilities from a small gym, to long term care facilities and even a large prison. Stay away fom instant hot water heaters as in the winter, they will not be abe to meet the demand. We have repaced several "instant" sstems! 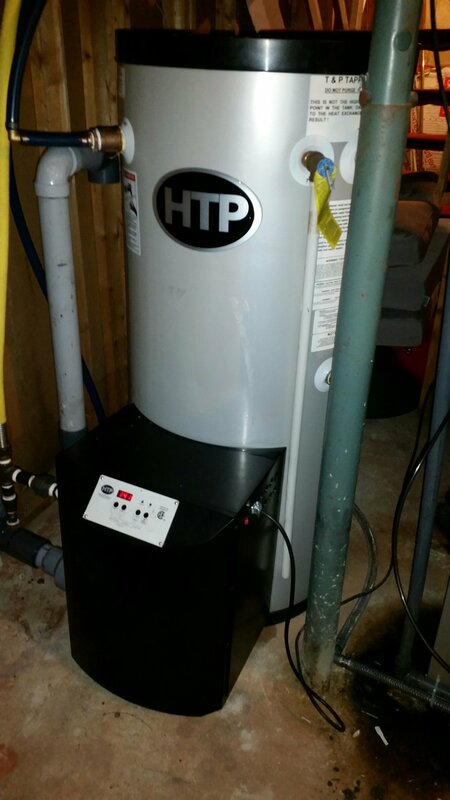 I would go witht the HTP Phoenix moduting hot water tanks. ou need to know what capacity in pounds of each washer. Contact HTP and they will ize the tank or tanks for you. I just installed this past Saturday a PH100-55. Also, it was my first pex experience. Low fire had an amazing 0 CO. It is much quieter than my previous power vented unit. It is nice to watch it modulate. It was also very easy to program. Ah, Henry, I am going to call a foul here. First of all, congratulations on your successful systems. Improperly designed anything will not produce. Design it correctly and install it correctly and the tankless systems rock. Henry , Nice Phoenix , great choice . have your instruments tested or calibrated . Many areas of Alaska have very cold incoming water , imagine that . Some places even have to have excessive bury depths and circulation pumps on the services to keep them from freezing . I don't believe tankless hype having fixed , repaired , replaced many of them , many others here haven't fallen for it either . The Lochs are good and so are the tanked units like HTP Phoenix . Lots of water blown insulation around that tank also to keep standby losses to a minimum . Either way you can't go wrong . I can tell you for certain the HTP Phoenix is a beast and will perform for quite some time . Heat exchanger is the most superior HX in the industry , low maintenance because of the HX design . Rich, the cold water coming in is very cold; Good reminder. I'll still debating between the Lochs and HTP. With a tank unit and the draw down that occurs with use I wonder if system will be able to generate hot water as needed (?). Solar preheat? Raising 35°F water to 55°F is insanely efficient. 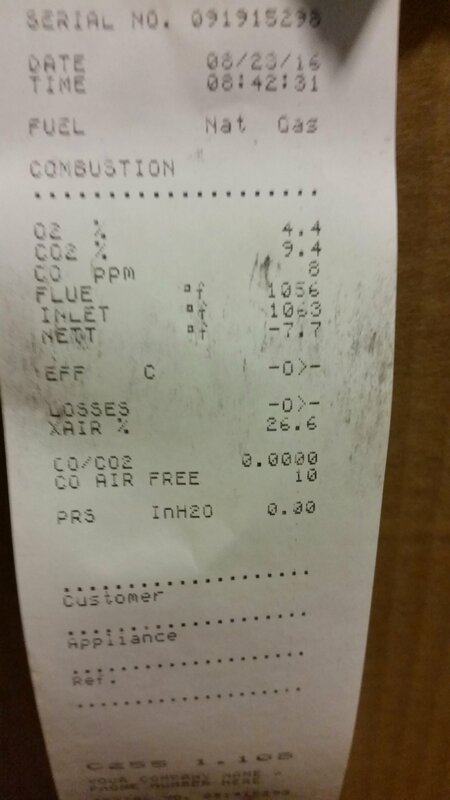 We get all our combustion analisers calibrated on a regular basis. 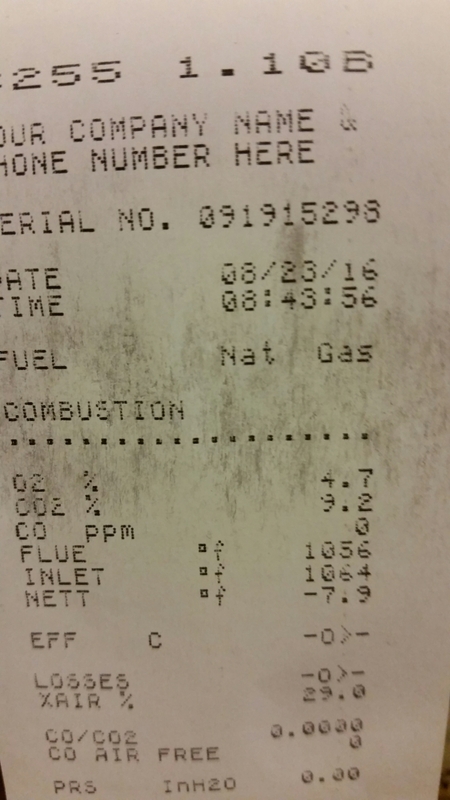 Natco is short for National Combustion. They have a website. I used to work with John Orr, when we were both at the rep. John left to buy Natco. They're in Queens, NY, and they specialize in laundromats. John's son, Dan, now runs the company. I remember the day he was born. It's essentially a steam boiler that doesn't let the steam out. The coil sits in the steam and makes lots and lots of hot water. QuikWater is another option for very high demand jobs. I'd recommend investigating ThermoMax tanks from Thermo2000 in Canada. The output from a single 120 gallon tank is basically limited only by the BTU input. Paired with a modulating condensing boiler like an FTXL Lochinvar the efficiency is nuts. We have a pair of 850's on a single 120 gallon tank and it will produce a steady 27GPM @ 100* rise all day long with both boilers running about 55-60% firing rate. Crazy to see the flue temp pegged right at the return water temp. The Thermo2000 products are made in Quebec. They don't last. The usual culprit is the thin copper coils develop a leak. You are much better off with a HTP S/S indirect. If you have the room multiple water heaters piped & valved so that you can switch from parallel (busy) to series (longevity). You are not allowed to plumb water heaters in series. It is only paralelle or reverse return. The Thermo2000 products are made in Quebec. They don't last. The usual culprit is the thin copper coils develop a leak. The coils are Type L soft copper. What kind of pH is your water up there? The problem is not the water but that they use Type M thinwall copper tubing. We have had buildings with type M that had too much flow in the hot water piping system that developped erosion and leaked. We replace them in apartment blocks and hotels with either HTP indirect hot water tanks or others specified by an engineer. Thanks, Henry. I was under the impression it was Type L tubing. I'll ask more questions before we finalize anything.